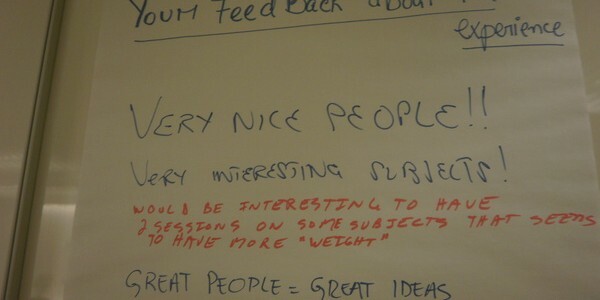 I want to share with you my experience with an open space format meeting. 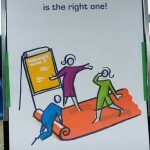 In the last 2 years I participated in few events where open space format was part of it. I really like the format and the interaction. 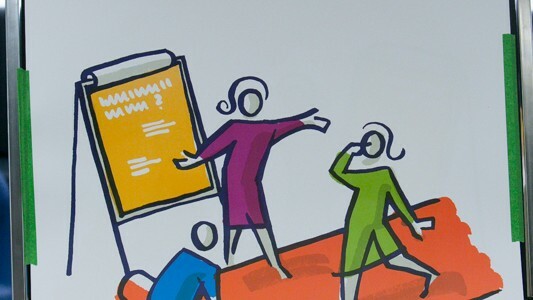 Due to that, I decided (finally this year) to participate in my first Agile coach camp. What a conference!!! Sorry, what an “un-conference”… the best experience for me. Due to my great experiences and my huge curiosity, 3 months ago, one group of Agile Practitioners and myself created one meet-up group. The goal of this group was very simple: “Share knowledge and experience between Scrum Masters, Agile Coaches and Agile Practitioners”. Nothing new as a goal, but it was very interesting for us. Our beliefs: “We want to become lifelong learners and professionals always in-training”. Number of people expected: 25 people (We didn’t want too much, our goal was “try” this format with a reduce number of people before we reach a big number). Can we adapt this format to other kinds of activity? Are we able to learn or ask questions in a short period of time (30 min)? Venue outside of downtown, is it a good idea? Since it is an event without an agenda, will the people have enough energy at the end of the day to do the agenda and interact actively? After 3 months of hard work, we are so proud of the result; for me, it was a huge success. I really like the result, a great experience, where we learned some new things. 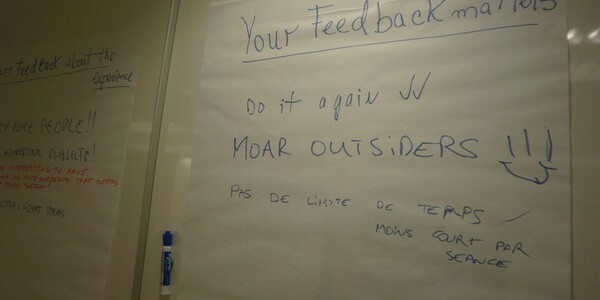 We got very useful feedback (see pictures) and we are ready for our next event in September (check here our next full day event). And of course, thinking something bigger for next winter. Organization skills: Great group, hard workers and very attentive to detail. 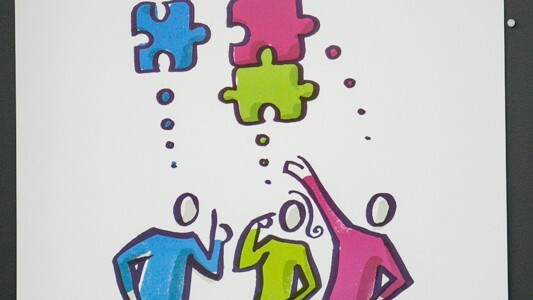 Facilitation skills: I got very good comments and people gave me good feedback. I could say that I did it very well. However, I know that I have a lot of room to improve. I really like the feedback I got and I will work hard to improve myself next time. My personal mark is 6.5/10 (I am very exigent with myself 🙁 ). My personal comment: I love the experience; I want to repeat it ASAP. Short meetings using open space format: This format worked very well. It was 30 min. of networking at the beginning, 15 min. of presentation (open space principles, law, rules, market place presentation and fill up), 2 sessions of 30 min., and 10 min. closing. This format worked very well (check session time comments). Interest in this kind of event: There was considerable interest for this kind of event. Since it is the first time and we didn’t do a big marketing campaign, we are happy with the interest that the event got. Can we adapt this format to other kinds of activity? : Yes, we really could adapt it to other kinds of meetings. For example, HR & recruiting activities, resolving issues activities, and more. Are we able to learn or ask question in a short period of time (30 min)? : The fast answer is yes, but, 45 min. or 60 min. sessions could add more value depending on the topic. We took a risk with the session length and it worked well. Next time, we could let the people decide the session length based on each topic and/or interest. Venue outside of downtown; is it a good idea? : We didn’t get a lot of attraction from people from downtown companies; however, we were able to detect few factors, like the start time, which was not the best time for someone to take the highway (rush hours traffic). Something to think about it. Since it is an event without an agenda, will the people have energy at the end of the day to do the agenda and interact actively? : No question about this one, everyone was so engaged and had a lot of energy. Very well self- organized. I hope you enjoyed the reading and if you have any comments or you want to share your open space experience, please, do so.